There are few places more beautiful than Maine! Hit the road and take in all the great state has to offer. From the docks of Portland, to the forests of the great north, you're in for a great ride! Maine is packed with a rich history, diverse people, and beautiful landscapes. With so much to do and so much to see, it’s no wonder so many people love the region. The cultural heritage, food, geography, and lifestyle are just a few of the reasons people have so much pride in the region. Represent that pride by wearing this comfortable and breathableteeas a form of expression for your passion. Enjoy the high-fives that come as you encounter those with the same Maine-iac passion. Our shirts are made withhigh-qualitymaterials to ensure a comfortable, breathable, and flattering fit. We use 100% cotton or a cotton-polyblend. 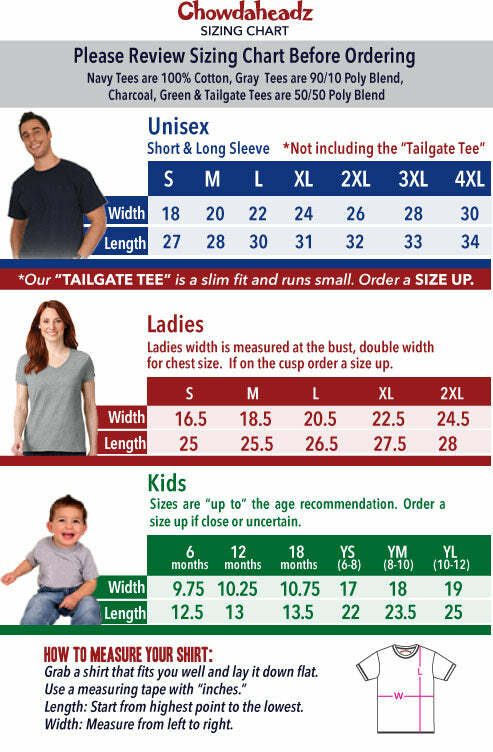 We also make our shirts in many sizes and will fit as expected. Whether you’re a long-time resident who calls Maine home, or you’re a tourist wanting to commemorate a great vacation, you’re sure to stand out in a crowd or at a sporting event with this high-quality tee that was decorated and printed in the USA by hard-workingmenandwomen. This particular shirt comes in navy blue and features a US highway sign icon with an outline of the state of Maine on it. It also has the word “Maine-iac” written across thetopof the sign. Thegraphicportion of this shirt has a distressed, vintage appearance. This comfortable t-shirt makes a great gift for any Maine-iac in your life. FromChristmasgifts tobirthdaypresents or even just because, this shirt is sure to delight any Maine-lover, regardless of the occasion. Chowdaheadz is a company that is owned and operated by passionate New Englanders and has 15 years of experience bringing you top-notch New Englandapparel. We love our region and strive to help others sport their pride as well. Weworkto ensure that your orders are correct from fulfillment to packing and provide speedy shipping so that you get thebestcustomer service possible. No matter where you are in the world, show everyone how much you love Maine with your new Chowdaheadz apparel!